Small, lightweight auto-scrubber for tile or wood floors. Great for banquet halls, church floors, school halls, etc. Applies cleaning solution, scrubs and squeegees tile floors in either direction. Cleans in tight and small places. Removable tanks for easy filling, dumping, and cleanout. Clean solution capacity - 1.8 gal. Recovery tank capacity - 2.1 gal. Transport dimensions: 21.5" long x 15" wide x 18" tall. 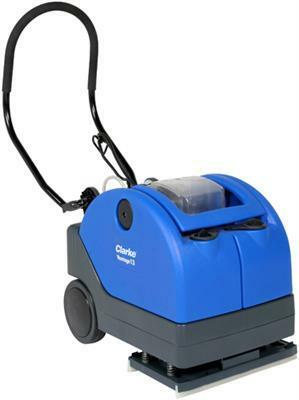 * Please call us with any questions about our autoscrubber floor 13 inch rentals in Oak Grove MO, Blue Springs MO, Independence MO, Lexington MO, Odessa MO, Independence MO and Western Missouri.